As it starts to get chillier in your home, take notice of spots where you and your family feel a draft. A long-term fix like installing energy efficient windows and doors are a great option if it isn't already winter. Until Spring, quick fixes like window film and draft guards, will help insulate your home and save on energy costs. The obvious reason to protect water pipes is to keep them from freezing. Pipe foam, which can be purchased at most hardware stores can insulate those pipes, protecting them from freezing and lowering that hot water bill. Is your heating system making strange noises? A tapping? Before winter weather hits, have a professional check out your heating system. This way, there's no chance of being stuck without heat on those long winter nights. These check ups will also alert you to any larger problems and prevent those major repairs from happening. 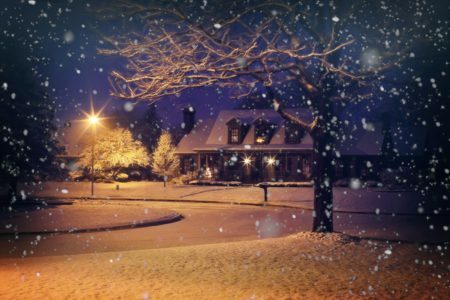 “What temperature should I set my thermostat at for winter?” It's one of the most frequently asked questions by homeowners, but usage-conscious households should consider easing into winter rather than a set temperature. When cold weather arrives, set your temperature where you are most comfortable. Each week, roll it back one degree until the household is acclimated to the change in temperature. Generally, anything between 68-72 degrees is recommended when someone is at home. If everyone is gone during the day, drop it down to 66 degrees. Replace furnace filters each month the furnace is in use. This will make the furnace run much more efficiently. If your entire furnace needs to be replaced, don't forget about the federal energy tax credit that can make that cost a little bit more affordable. Easy-peasy! Simply flip the switch on your ceiling fan so that the air is circulated clockwise. This change will keep your home warmer longer and that means less time that the heat is on. For more money and energy-saving tips, visit energy.gov.